An engine this small should, by conventional logic, not be this powerful. But, somehow, it is. And at this year's 24 Hours of Le Mans, Nissan plans to see just how well its under-sized, over-powered hybrid engine prototype handles auto racings's most grueling challenge. The minuscule engine is known as the DIG-T R. It's an 88 pound, direct injection, three-cylinder turbo measuring 20 inches tall and 16 inches long, with a 1.5L displacement. And yet it produces a whopping 400 HP, with a better power-to-weight ratio than this year's standard F1 engine. 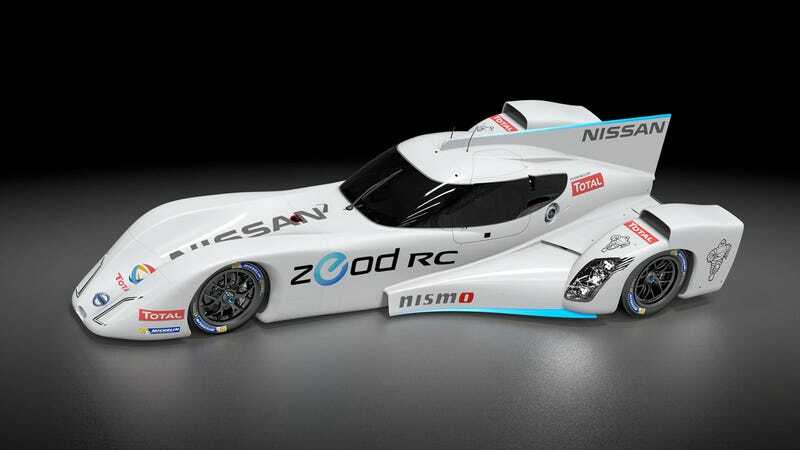 The tiny gas engine will be supplemented by a hybrid electric drivetrain, powered by chassis-mounted lithium ion battery packs, and installed in Nissan's ZEOD RC (Zero Emission On Demand Race Car). The ZEOD will race out of Garage 56, Le Man's traditional spot for experimental vehicles, so the only points Nissan will be interested in will be data points. "Downsizing is very important in the automotive industry," Darren Cox, Nissan's global motorsport director, told Autoweek. "We already have three-cylinder engines in our range and there are more coming. This is the first time that this configuration has been used at the top level of motorsport, but that is because we are pushing the boundaries in terms of light weighting. There are a lot of expensive materials in there and the crankshaft is a work of art. The engine is a stunning piece of engineering." This tiny engine is designed not just for power, but for efficiency. The more efficiently an engine runs at Le Mans, the less time the car loses for pit stops. As such, the ZEOD's hybrid drivetrain will run through its stores of electrical power in roughly one hour—Nissan calls them "stints"—before the gas engine kicks in to get the vehicle back to pit lane. There's no word yet on how the team will recharge or replace the depleted batteries—perhaps a rapid charge a la Tesla's Supercharging station, or simply hot-swapping the li-ion packs?